Update: This article was written when Eclipse was the Google preferred Integrated Development Environment (IDE) for writing Android apps. Now that Android Studio is the preferred IDE this article has been archived and is only here for historical reference. When coding and running an app in the Eclipse IDE, debugging can be performed on an Android Virtual Device (AVD). You may see ERROR Unable to load VM from snapshot, one solution is to clear Launch from snapshot in the AVD Launch Options dialog. Note: Changes saved in the AVD will be lost. To access the launch options start the AVD from the Android Virtual Device Manager. 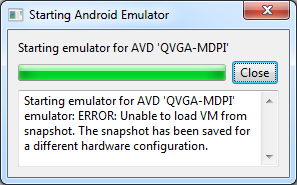 Starting emulator for AVD Name-of-AVD emulator: ERROR: Unable to load VM from snapshot. The snapshot has been saved for a different hardware configuration. If the virtual hardware upon which the emulator executes has changed then the saved virtual machine (VM) snapshot is no longer compatible with it. The virtual hardware can change if the hardware image has been updated by a new release of the Android SDK (updated by the SDK Manager), or the AVD configuration has been edited. A possible solution is to start the AVD fresh and not from a saved snapshot. Open the AVD Manager. Select the problem AVD from the list of existing AVDs. Select the Start button and the Launch Options dialog appears. 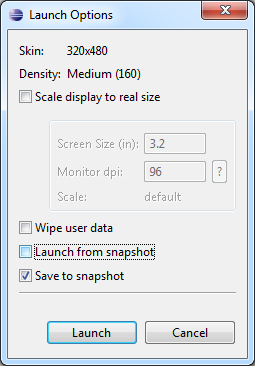 Click the Launch from snapshot check box to clear the tick before clicking the Launch button. The AVD starts from a fresh virtual machine image. Changes previously saved on the AVD are lost. Option save to snapshot is disabled on my AVD. How to solve it? Not seen that before, is the AVD directory write protected?